Our Most Functional + Technical Products. Everything You Need To Ride A Motorcycle, In Its Purest Form, Without Compromise. Tested Year Round In All Conditions, Each Item Has Earned Its Place. From The Ground Up, A New Direction For Protective Motorcycle Clothing. The Eversholt Jacket is fully lined with Dyneema®, an abrasive resistant fabric that’s fifteen times stronger than Steel. Removable CE approved D3O® Armour at the elbow, shoulder and back offer high performance impact protection when on two wheels. The Hockliffe Overshirt offers impact protection in the form of removable CE approved D30 Armour at the elbow, shoulder and back. The arms are reinforced with panels of Dyneema, an abrasive resistant fabric that’s fifteen times stronger than Steel. Made in England, the heavyweight outer shell is sealed with a concealed Aquaguard zip. This works in conjunction with a removable collar-tab that closes the neck, reducing wind chill when on two wheels. For colder days, adjustable cuffs allow the sleeves to be tightened to retain heat. Side entry chest pockets allow for easy access. The arms and body are cut longer to keep wrists and the lower back covered. 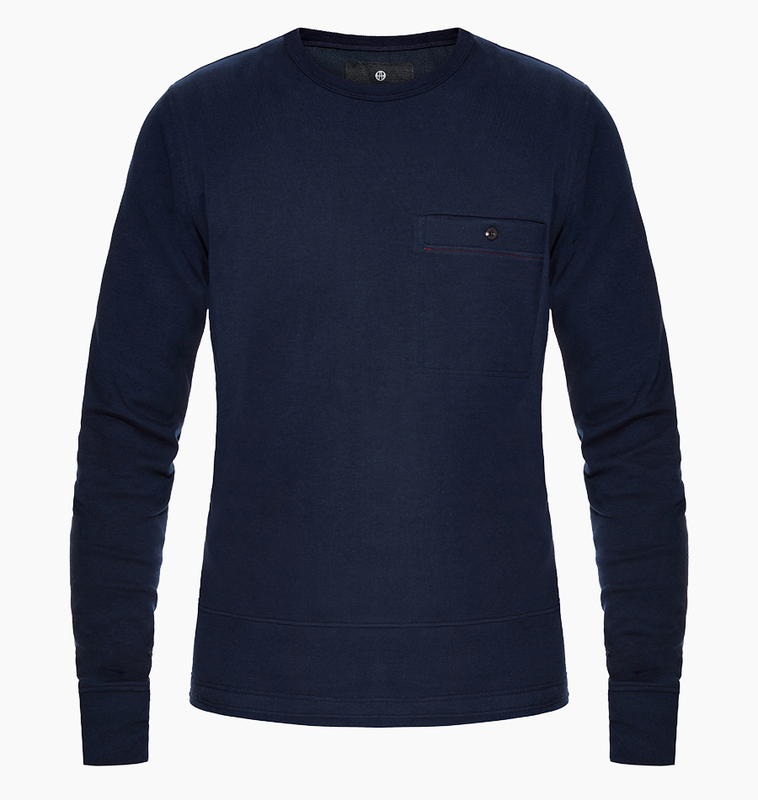 The Cardington Sweatshirt is a thermal sub-layer designed to look like a normal sweatshirt. Made in England, a 100% windproof baffle lines the front panel of the garment. This is paired with an extremely dense 14oz interlock jersey that’s as effective at reducing wind as it is at trapping heat when the temperature drops in the evening. To stand up to rigorous use, this bespoke fabric was knitted with a Star Supima Yarn produced by the first mill to spin cotton in the UK for fifty years. Twice as strong as a regular grade cotton, this fibre adds stability - maintaining the fabrics effectiveness and garment shape. The sleeves are cut long and tight to seal the void between jacket and glove. A grip-tape around the hem stops the garment riding-up when reaching for the bars. This is a sweatshirt, the way it should be. The Orkney Baffle is designed to seal the gap between jacket and helmet. It took six months and ten prototypes to fine-tune the stitch density, retention and panel construction. Made in England, the baffle features split panels at the front and back to ensure no draught cuts through and the lower section stays tucked in when riding. For the best thermal properties, we choose an Italian Merino Wool - the hollow fibre allowing the yarn to trap and regulate heat. To achieve a seamless construction for maximum comfort when worn under a helmet, we worked with a 1962, Wildt Mellor Bromley RTR twelve-inch circular knitting machine. Of the three thousand produced, only thirty are still at work in the UK.